Growing up my family always went to church on Sunday nights. Sunday nights were less formal than Sunday mornings. Choruses would be sung, there would be a time for testimonies, the message would be shorter. I liked Sunday nights. I was allowed to wear shorts on Sunday nights. Occasionally we would be treated to a performance by the Roy Houser Gospel band. More about the band in a moment, but first a little about Roy. He was a saint in his early seventies. He was married and had children and grandchildren who attended our church. Roy was a great guy, his love for the Lord was obvious. He was a person who reached out to others, and declared the love of Jesus. Roy had his own gospel band. He was the leader, and played the bass guitar. Another lady played the accordion, someone else would play the piano. They had a somewhat folksy style. The band was not terribly talented, probably the reason they always performed on Sunday nights. The band irritated my mom a little bit. When she heard that they were going to play she would say “oh brother!”. I liked the band, but not so much for the quality of music. It was nice to see a group of people playing who obviously loved the Lord. I first realized that electric guitars weren’t evil because Roy had one. He had a bass guitar. It looked like something a rock band might use. My keen young mind realized that if Roy had an electric guitar and brought it to church, electric guitars must not be so bad. Over the years it seemed like Roy’s band might die out. Some of the other performers aged and were unable to play. The band played less often. It made me sad. But the band was going to live on. One day Roy came up to me and said “Hey boy! How would you like to play in my band?” Roy never called me by my name. He always said “Hey boy!”. I don’t think he knew my name. Nonetheless I was honored to play in the band (I played the trumpet). I wasn’t the only new person to join. Roy was busy recruiting. The band would survive. A younger group now, with Roy still at bass. We still weren’t terribly talented. One day I realized that fine music wasn’t the point of the band. It never had been. For Roy it was about praising the Lord and reaching out to others. He found people, like me, who enjoyed playing music, whom he could minister to. He brought us together. He told us how Jesus had worked in his life, and how Jesus could work in our lives too. I played in the band until I went to college. After I left, Roy was still busy recruiting other band members. Roy died about 10 years ago. Today he is no doubt playing his bass guitar for the Lord. I look forward to the day too when I go to heaven. I will see Roy there. I know what he will say too. “Hey boy! How would you like to play in my band?”. Then we will play music for the Lord. 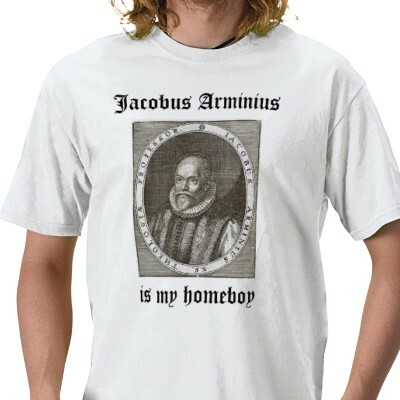 Today marks 400 years since the death of Jacob Arminius. It seems an appropriate day to recognize him because it means that he has been in heaven with the Lord for 400 years! Pilgrim People: How Reformed must a Reformed minister be? Know of any other sites recognizing the day? Drop me a comment and I’ll add it! Pastor George Zeller writes about the danger of teaching that Christ died only for the elect. Who were the Sadducees? Here is a nice little overview by Ken Schenk. Blogger Jonathan Robinson explains what is wrong with TULIP. Below is a complete list of the delegates to the Synod of Dort. The list is pulled from two different sources, so the spelling is not consistent (Some names are Latinized, others Anglicized). There were no official delegates from several regions. The Dutch states of Holland and West Freisland were excluded. They had attempted to send Simon Episcopius as their delegate, and one of the first acts of the synod was to revoke his status. In France, Louis XIII opposed the synod and prohibited French participation. In Brandenburg (Germany), the Lutherans prohibited representation. Only official delegates are listed. This excludes deputies, secretaries, observers, etc. William Ames (Guilielmus Amesius) (1576–1633). I just ran across this web site: Library of Theology. They have quite a bit of good information relating to the Calvinist / Arminian debate. There are lots of video and audio links. Much of the content is not classical Arminian (ie open theism, moral government, rejection of original sin, etc). Still, it is a worthwhile resource.